Looking for a fully integrated RM/DM solution? 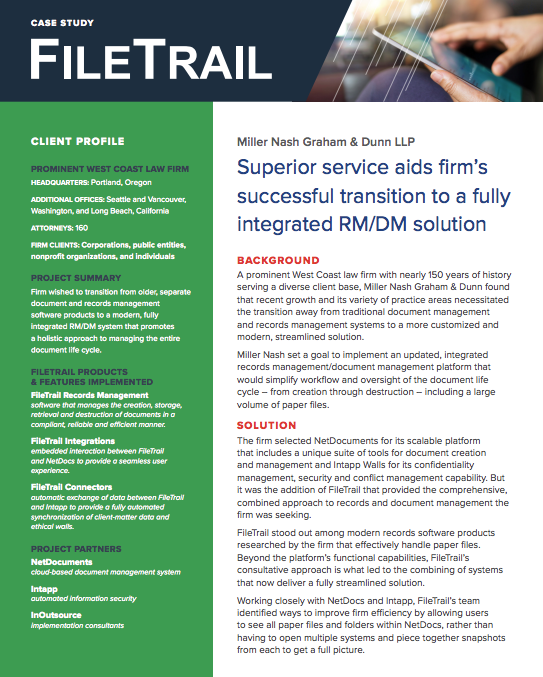 Prominent West Coast law firm Miller Nash needed to replace its traditional document management (DM) and records management (RM) systems. Its ultimate goal? To rollout an integrated RM/DM platform that simplified records management for both paper and electronic files. After researching solutions, Miller Nash selected NetDocuments and FileTrail. Why FileTrail? Easy integration with NetDocuments, a streamlined user interface, and simplified workflows for the entire document lifecycle. FileTrail stands out from the competition.